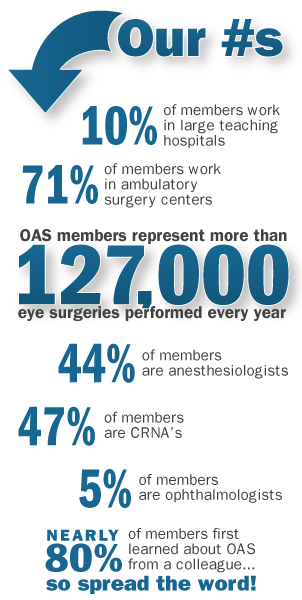 Ophthalmic Anesthesia Society - Why Join? We are committed to bringing together anesthesiologists, ophthalmologists, certified registered nurse anesthetists and other professional personnel – people like you. We believe that collaboration, education and training can lead to the highest quality anesthesia care for patients undergoing cataract and other ophthalmic surgical procedures. With that in mind, we are also excited to offer new members a 15% discount on registration for the 33rd Annual Scientific Meeting in Chicago, September 13-15. When you join OAS, your activation email will contain a special code you can use to purchase your discounted ticket! Special priority communications on clinical situations requiring immediate attention, including up-to-date information on the latest techniques, regulations, products and news in the subspecialty of ophthalmic anesthesia. Access to cutting-edge, members-only online discussion forums that promote and encourage scientific innovations related to the provision of high quality patient care. The OASIS newsletter (distributed electronically three times a year) with timely updates on clinical and political issues in the subspecialty of ophthalmic anesthesia. Permission to members-only information on the OAS website, including presentations from previous annual scientific meetings. An annual roster of OAS members for networking opportunities with colleagues from around the country and around the world. Reduced registration to attend the annual scientific meetings. Most importantly, OAS provides you with solutions in providing the highest quality of ophthalmic anesthesia patient care.